The season for bridal shows is almost upon us. Here are a few survival tips to make it through the day and really get the most out of it for your wedding. ~Remember to take your time, walk through the event and then come back to vendors you really want to connect with. ~Set up a wedding email address, and use this when you are asked to leave an email address. Make sure you do check this account often enough though, because you may be offered worthy deals, or win a prize. Brides have also found that bringing along labels with their information already printed on it is a quick way to leave your information. If you come with a group, make sure they all know what information you are willing to share with the vendors. ~Be honest. If you don't have a wedding date, tell the vendor. Don't make up a date, but do share what season you are looking at. ~If you have already have a vendor, you should still stop and at least take a look. You may see that they have other deals that you could use at a different time. If you already have a photographer, you may get photograph ideas, or you may wish to book another photographer for your Jack 'n Jill, or your shower. If you have a cake already, you may find a cake baker for your shower cake or even wedding day favors. ~Take in the ideas. Realize that at a show some of the ideas may be over the top but it is to mostly showcase that they can do anything for you. Even if you don't like the color combos, look past them and look at the idea. See what ideas you can bring to your wedding or how you can take an idea and make it your own. ~If you see something you love, like an arch, or cake stand, see if you can rent them for your day. Or ask where you could locate the item to rent or purchase. Remember some vendors do sell goods right there at the show. ~It is a good idea to think of questions for vendors before hand. ~Bring your camera along. if you fall in love with something, such as a decorum item, ask the vendor if you can take a photograph. I know I said this before, but just to reiterate, take your time. A bridal show is suppose to bring you ideas, help you find vendors, and be an enjoyable day out with your friends and family. I often find myself mentioning the small mill town of Taftville, and the response 80% of the time is "never heard of it". Once I mention that Taftville is considered a neighborhood of Norwich with it's own zip code, people start to have an idea of the location. Now you may ask, what happens to be in Taftville worth discussing? 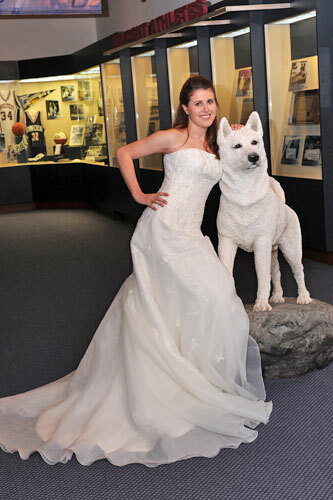 It is a great little New England town, with a wonderful selection of wedding gowns. That is right, I said wedding gowns, along with so much more. 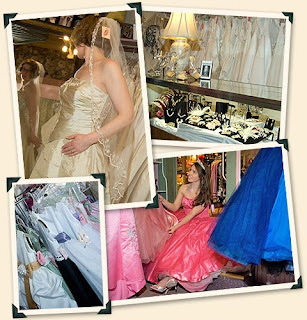 Love Me Two Times is an upscale consignment shop, with a bridal boutique, offering once- and never-worn wedding and formal gowns. This is the place to shop for savvy brides seeking a way to get the gown of their dreams while saving on their budget. Designer gowns like Lazaro, Maggie Sottero, Tiffany, and more are available and no appointment is necessary. The nice thing is, brides are always welcome, no need to make an appointment and have the high pressure sale pitch. The ladies of the boutique are interested in assisting, listening, and locating "your" gown! The shop is filled with current styles, and besides just wedding gowns, think of them for your Mother of the bride & groom selections. Attending a wedding and need the perfect dress? They're always worth checking out. If the dress doesn't fit like a glove, not to fear, a seamstress can make it work. If you're not sure of the next time you will be in Taftville, then you are in luck. 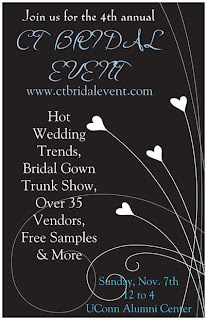 Love Me Two Times will be setting up a mini bridal boutique at the 4th annual CT Bridal Event. You never know, you may find the dress of your dreams at our event. Or you may at least find the right accessories, veils, shoes, gloves, wraps and more! Plus once again, they will be offering a special $99 gown section. I felt the need to share this. I'm working on starting a branch here in CT with some great talented wedding professionals. Take a moment to read this, make a difference, and get the word out. Founded in January of 2010 by CA wedding planner, Liz Guthrie of San Jose Wedding Consultants, Wish Upon a Wedding was created to help couples who did not have the time, money, resources or strength to plan a wedding on their own, because of terminal illness or other serious life-altering circumstances. The organization now celebrates the courage, determination and spirit of these couples by granting their dream wedding wishes. It is their goal that chosen recipients can inspire other couples facing similar situations to find hope and strength, while raising awareness for terminal illness. Growing up with a sister who was deaf since birth, and raised by parents who ran a board and care home for people facing numerous disabilities and life hardships, Liz learned early on to value the many blessings in life, and the importance of helping others. Volunteering throughout her life for a variety of nonprofit organizations, Liz was looking for a way to combine weddings and community service. Shelly and Jay married in Seattle on May 2. Shelly passed away three weeks later. She had been battling a rare type of cancerous lymphoma, and Jay suffered from Multiple Sclerosis.